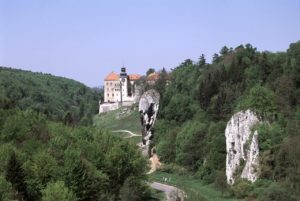 The castle in Pieskowa Skala has a long history as part of the Eagles’ Nests Trail. It is also one of the best examples of Renaissance architecture in Poland with tradition as a seat of several noble families. Located just 40 km from Krakow Old Town and surrounded by the astonishing beauty of Polish Jurassic Highland, Pieskowa Skala is well worth a visit. The oldest information about the castle in Pieskowa Skala comes from 1315. At that time the remnants of fortification system were found in the nearby village from the turn of 12th and 13th centuries. These fortifications were to guard the valley that connected Krakow and Silesia. 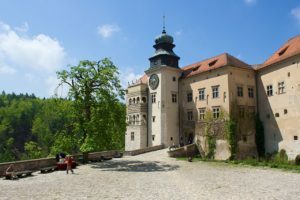 With the same purpose, the new castle was built in that place on orders of king Casimir III the Great as part of the Eagles’ Nests chain of defensive castles in the 14th century. The castle was erected on a rocky outcrop and its steep slope served as a natural impregnable barrier. 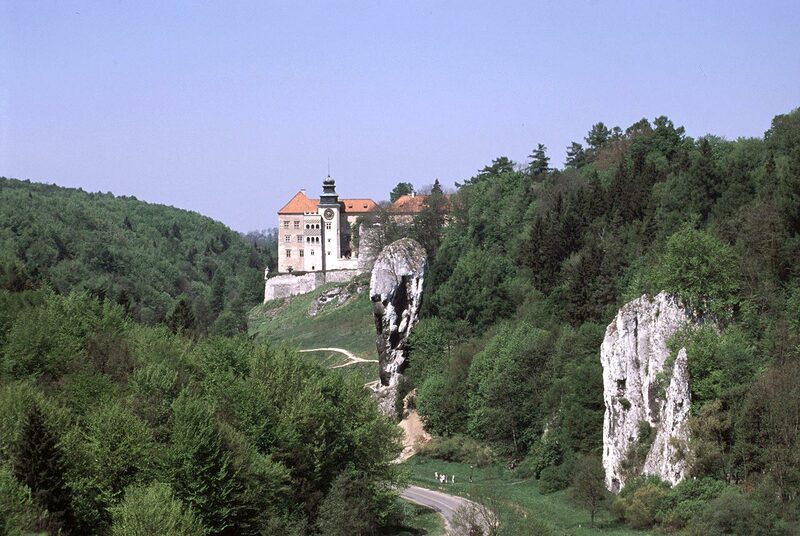 The Eagles’ Nest in Pieskowa Skala comprised of the lower castle and the upper castle, that no longer exist today. The lower castle was located on the site of the present Renaissance courtyard and included farm buildings surrounded by defensive walls. The castle in Pieskowa Skala remained in royal possession until the end of the 14th century. In 1377, king Louis the Hungarian, who took over the Polish crown after Piast dynasty had disappeared, gave the Pieskowa Skala castle to Piotr of the noble Szafraniec family. 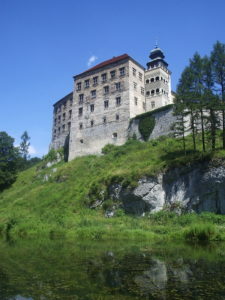 The Szafraniec family gained the full ownership rights to the castle in 1422 from king Wladyslaw Jagiello in recognition of faithful service at the Battle of Grunwald. Piotr Szafraniec, voivode of Krakow and Jan Szafraniec, crown chancellor were also close and trusted advisers to the king. In the next generations the Szafraniec family had squandered wealth, lost their high status at the royal court, and good name. 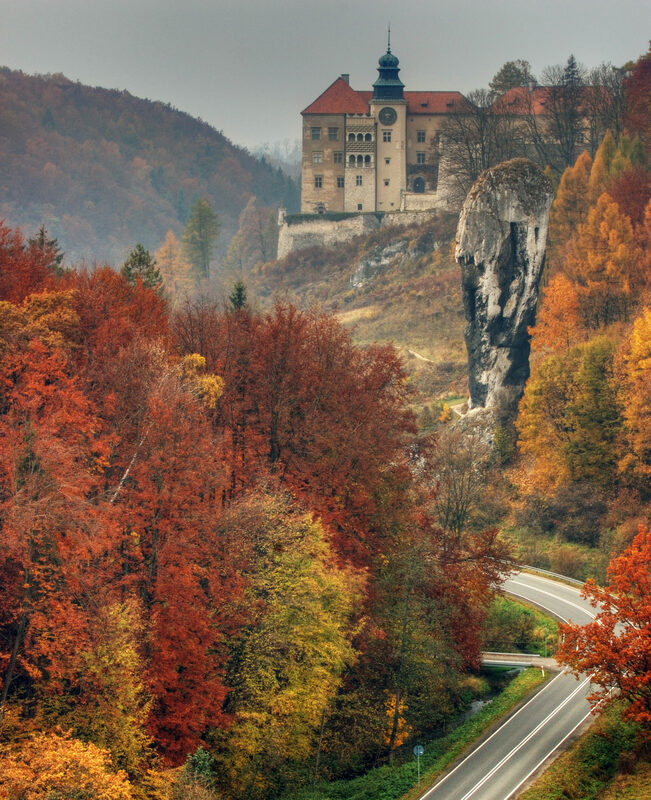 It is said that the third Szafraniec named Piotr was practising alchemy and black magic at the castle in Pieskowa Skala. His younger son, Krzysztof is one of the most famous Polish raubritters – robber knights. In 1484 he was arrested, convicted and beheaded at Wawel for his misdemeanour. The 15th century, despite the dramatic fate of the castle’s owners, brought further development of the castle, especially its defence system. In the 16th century the owners of Pieskowa Skala once again began to play a significant role at the royal court. Hieronymus Szafraniec enjoyed a special trust of king Sigismund I the Old. The king’s daughter Regina married Hieronymus and with the money from her dowry the reconstruction of the castle in Pieskowa Skala begun. King Sigismund I the Old introduced Renaissance into Polish court with such foundations as the Sigismund Chapel in Wawel Cathedral. The Italian fashion also made its way into Pieskowa Skala due to close friendship between Hieronymus and the king. However, the reconstruction was completed only by the next castle owner, Hieronymus’ nephew Stanislaw. Stanislaw also enjoyed high status at the royal court and was very dedicated to protection of Polish Protestants. He founded many churches and Calvinist schools and supported his fellow believers generously. During Stanislaws’s time, an arcaded courtyard and observation loggia were erected in Pieskowa Skala. The courtyard decoration consisted of naturalistic mascarons, cartouches with coats of arms and portals. Also a magnificent garden was planted. In 1608 the last representative of Szafraniec family, Jedrzej died, and the castle changed owners, ultimately falling into hands of Zebrzydowski family. Michal Zebrzydowski, voivode of Krakow, made further reconstructions of the castle. This zealous Catholic, who made many foundations in Kalwaria Zebrzydowska, build a magnificent chapel in the northern wing of Pieskowa Skala. He also ordered reconstructions of fortifications, as the defensive system of the castle was completely outdated at the time. However, these fortifications proved insufficient, as in 1655 the castle failed to resist the attack during the Swedish Deluge. The castle was captured, destroyed and robbed. From the 17th century onward, the castle changed owners several times. After the Swedish Deluge, the Wielopolski family took possession of Pieskowa Skala and invested in returning the castle to its former splendour. Jan Wielopolski, manager of Royal Salt Mine in Wieliczka who had strong influences on the royal court, turned the castle in Pieskowa Skala into a magnificent residence worthy of the high status of its owner. Pieskowa Skala no longer served as a family seat, but as a quiet retreat, very popular amongst the members of Wielopolski family. In the first half of the 18th century, Hieronymus Wielopolski settled here after moving away from public life. He had his carpentry workshop here, he also tried to work as a blacksmith. The castle, slightly neglected and destroyed by the fire of 1718, was completely renovated and rebuilt during Hieronymus’ time. Italian arcaded cloisters, not suitable to Polish climate were walled up and the observation loggia was closed. The castle towers received flagon-shaped helmets. Rooms were redecorated in line with the 18th-century fashion. In 1787 king Stanislaw August Poniatowski visited the renovated castle. From the mid-19th century the castle in Pieskowa Skala fell into hands of Mieroszewski family, a well-known family of politicians and art collectors from Krakow. Jan and Sobieslaw Mieroszewski also contributed a lot to refurbishments of the castle. Unfortunately, after the fire of 1850 that severely damaged the castle, the oldest part of Pieskowa Skala, the upper castle dating back to Casimir III the Great, collapsed. Renovation works were not yet completed when, in the course of the January Uprising of 1863, the castle was once again damaged, this time by artillery fire. On the night of 3 March 1863, a battle took place at the castle. At night, the combined units of insurgents were surrounded by Imperial Russian Army. They managed to break through and leave, but the Russians took the abandoned castle, plundering and devastating it. Local peasants, incensed by invaders, completed the destruction. The renovation works carried out by Sobieslaw Mieroszewski gave Pieskowa Skala a fashionable, neo-gothic character. The circular tower received a picturesque battlement, decorative turrets appeared, and the observation loggia was converted into a large tower covered with a pyramid roof. By the end of the 19th century, the Mieroszewski family had to sell the castle and new owners were not able to maintain it. With the beginning of the 20th century, several wealthy families from Warsaw created a joint stock company to protect Pieskowa Skala from further destruction. In the years 1903-1939, a luxury guesthouse was located in the castle. At that time, the long tradition of closeness between Pieskowa Skala and Krakow stopped in favour of Warsaw, because the castle was incorporated with other Polish lands into Russian Empire. Krakow was part of Austrian Empire, as a result of Partitions of Poland. During World War II, the castle served as an orphanage for hundreds of children, mostly from Kresy (former Eastern Borderlands). After the war, Pieskowa Skala, just like so many other palaces, residences and castles in Poland were nationalised. In 1959 thorough restoration works began. Architectural studies were conducted that revealed the elements of Renaissance architecture and decoration. 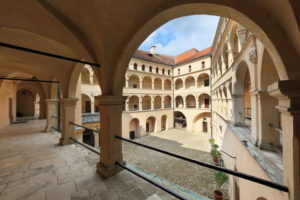 The 16th-century arcaded courtyard and observation loggia were reconstructed. Unfortunately, no original interior design survived. For that reason, Pieskowa Skala fell under the auspices of Wawel Royal Castle, which authorities prepared a special exhibition from Wawel’s equipment. 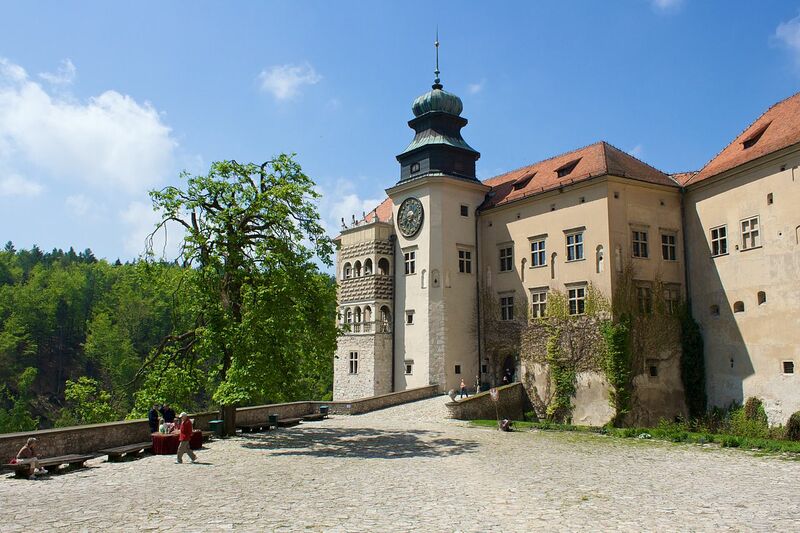 The official opening of the castle in Pieskowa Skala turned into a museum took place in 1970. Tuesday – Friday 10 a.m. – 4 p.m.
Tuesday – Thursday 9 a.m. – 4 p.m.
Saturday, Sunday 9 a.m – 5 p.m.
Tuesday – Thurdsay 9 a.m – 5 p.m.
Saturday, Sunday 10 a.m. – 6 p.m.
Tuesday – Thurdsay 9 a.m – 4 p.m.
Saturday, Sunday 10 a.m. – 4 p.m.
* The castle in Pieskowa Skala is closed on Mondays, January 1st, Easter Saturday and Sunday, November 1st, November 11th, December 24th and 25th. ** The outer courtyard is open daily from 8 a.m. till dawn. *** Last admission one hour before before the above closing times.